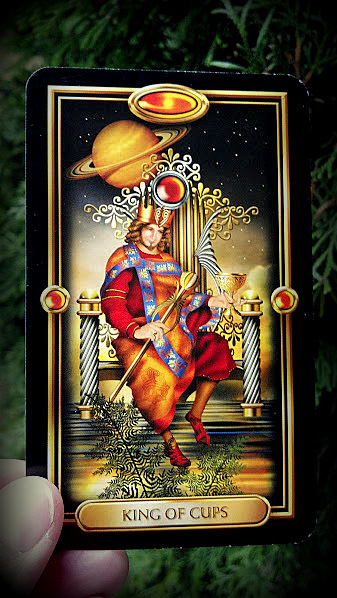 When I draw a card for the day with no question in mind, I seem to get no real answer. Today I drew the King of Cups. The king in this card doesn't look as happy as one would expect a king to be. He looks like he is thinking about something he has lost or maybe remembering someone he misses. Maybe despite his high position, he has regrets and can't stop thinking of them. They rob him of the joy he should be experiencing because he has everything a man could want in life. Maybe this is a reminder to me to count my blessings. Instead of focusing on what I don't have, I should focus on the many things I do have. I have everything a woman needs to lead a joyful life. Honestly, all of us do because joy is not dependent on circumstances, the balance in one's checking account, or a number on the scale. Today, I will focus on being present in the moment and I will say a small prayer of gratitude for each of the blessings I notice as I go about my day, and in that case, I could pray all day long. It's funny, sometimes I get no real message at all from the cards until I start writing about them. Love the message you came up with, and hope you were able to put it into practice. I think I shall try that today - my card was the Fool, and it told me to remember to smell the flowers of life, which is not that different from giving thanks for all the small blessings we are offered!